You likely know a super successful software sales representative who has enjoyed a million dollar earnings year, drives around in a luxurious automobile and flaunts a seemingly endless expense account. It’s natural to question if their success is just plain luck or they happened to be at the right place at the right time. I subscribe to Roman philosopher Seneca who said: “luck is what happens when preparation meets opportunity.” But being successful in the past is no guarantee of future success, especially in today’s B2B sales ecosystem. There’s an emerging challenge facing the B2B sales representative: a majority of the buying process happens BEFORE the prospect engages with a sales rep. Reputable industry research firms like Sirius Decisions estimates 67% of the buyer's journey happens digitally before engaging a sales rep and Corporate Executive Board (CEB) estimates it at 57%. Additional viewpoints from Salesforce and TeleSmart Communications estimate by 2020, 85% of buyer-seller interactions will happen online through social media and video. Regardless of the exact percentage, it’s generally accepted that the way businesses buy today is much different from just ten years ago. The digital world we live in provides buyers with countless sources of self-service information and insights which used to require sales rep interaction. So does this mean the end of the software rep? Not at all! 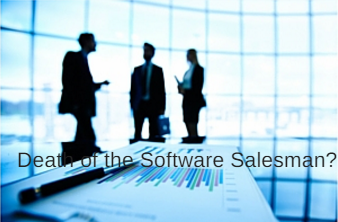 What it means is today’s software sales reps need to adapt and embrace a different way of selling compared to the past. If it’s true that 2/3rd of the sales process happens before a sales rep is engaged, that results in the sales rep having just 1/3 of the time to really make an impact. Engage early: Don’t just wait for the phone to ring. Get out and seed potential prospects before they are even asking for a solution. Be social: Leverage digital marketing tactics such as social media to reach today’s buyer. Marketing should be your best friend so work with them closely. Sell solutions, not tools: Don’t commoditize your offering as a ‘tool’ and instead position the end ‘solution’. Remember tools are just cheap ways to build something. Relevance matters: Don’t demo bicycle data to a bank. Trust me, I’ve seen this one fail time and time again. Know the customer’s business and speak their language. Be different: Set yourself apart from the competition through creative tactics such as peer-to-peer best practice sharing and hands-on workshops. Demonstrate value: Quantify the anticipated return on investment (ROI) early and often. If there’s no value, there’s no deal. Integrity and hard work: At the end of the day, I’m a big believer this wins out over all others. Doing the right thing matters to most people and sales is no exception. So what are your tips to outperform in sales? Please add any comments or ideas below. The Internet of Things (IoT) is a whole generation of smart objects! Leave anecdotal evidence in the past and make decisions on fact-based analysis!